The D2X has landed, and with it come the hopes of a generation of Nikon devotees keen to see their company match arch-rival Canon. Unfortunately for users of Nikon, the company has perpetually been a step behind its competitor in the race for sensor development. Since early 2003, Canon users have had the 11MP EOS 1DS, and Nikon users just 5.9MP with the flagship D1X (first introduced in 2001). While the D2X can't match the new 16.7MP EOS 1DS Mark II in terms of pixel resolution, knowledge of the post-capture process has now taught pro and amateurs alike that megapixels aren't everything. A decent 12MP sensor is sufficient for most applications, but a high-quality 12MP camera can be pushed further than its pixels might suggest - even to the same ceiling as the EOS 1DS II. The most revolutionary and unprecedented aspect of the D2X is its High Speed Cropped mode. This gives users the ability to switch from five frames per second shooting and 12.2-megapixels, to a smaller crop of 6.9-megapixels with a burst rate to match the D2H (8fps), even if the buffer's slightly reduced from that camera. The D2H can hold 50 full-quality JPEGs/40 RAW, while the D2X manages only 35 JPEGs/29 RAW. Bearing in mind that Canon's 8.5fps EOS 1D II hits just 40 JPEGs/20 RAW, this isn't too much of a handicap, and may well make the D2H redundant for those photographers who've got the cash. Where the D2X loses out slightly in terms of resolution to the 1D II in High Speed Cropped, it makes gains with focal length multiplication. This becomes 2x rather than 1.5x, and should prevent the need for slower, bulkier lenses, or even the use of teleconverters (a 300mm lens becomes 600mm). No user, professional or otherwise, can baulk at the chance to get essentially two cameras in one - a high-res unit for portraits, landscapes, architecture and still life, as well as a lightning fast midres unit for sports, press, wildlife and action shots. There are a number of other feature improvements on the D1X, and a few significant ones on the D2H (some of which are replicated on the new D2Hs). These include: a whopping 2.5-inch LCD; user-definable Func button; voice annotation; Kelvin settings for white balance; new, incredibly sophisticated autofocus system; simultaneous NEF (RAW) and JPEG shooting; additional high ISO noise reduction; support for the WT-2 802.11g wireless transmitter (and remote control from a PC/Mac); GPS compatibility, i-TTL fl ash metering system (user reports suggest it's far superior to D-TTL); new longer-life battery; and separate histograms for red, green and blue channels. The latter is exceptionally useful for getting the most out of shadow detail, allowing you to clip highlights in a single channel (with care), in the knowledge that information will be recovered at the RAW conversion stage. The only real backwards step is a reduction is fl ash sync from 1/500sec to 1/250sec, which will annoy those people looking to minimise the impact of ambient lighting with studio fl ash (High Speed Sync mode covers the fill-in base for on-camera fl ash in bright light conditions). The hefty body's a clever redesign of the D1X, and closely resembles the D2H - well-labelled and easy to decipher from the off, with recessed buttons to prevent accidental knocks. Even Canon users shouldn't have a problem getting to grips with the layout - it's substantially easier to fathom than the 1DS II's silly button combinations for Exposure mode, AF mode, Bracketing and Drive. It's also good to see shots left in the viewfinder, and all the necessary image parameters are in there too, so there's no need to take your eye off the action once you've sussed out everything in the layout. And there's no doubt that the Function button will enhance the workflow for the vast majority of users. The menu system's a pleasure to browse, aided as it is by that super-sized screen, colourful design and intuitive layout. There's a Recent Settings tab, which gives you access to the last eight options you've changed - something that you'll find yourself increasingly relying upon the more you use the camera. The same goes for the shooting banks, which are an excellent idea resurrected from the D1X, especially as each one can be labelled. Custom functions have their own independent banks and they're numerous and logically organised. And you can add speed to the growing list of D2X plus points, too. Power-up is instant, shutter lag is 37ms and viewfinder blackout just 80ms. It's pretty tough to hit the buffer limit unless you're really going for broke with 'Burst'. Where Nikon slips up is with its decision to encrypt the white balance information on this camera, meaning that third-party RAW conversion software like Photoshop CS2's own Adobe Camera RAW (CS has no D2X compatibility as of yet) and Phase One's Capture One Pro, can no longer read the 'as shot' white balance (though the less renowned Bibble Pro has found a way). For those people regularly batch processing large volumes of files this is a real headache, as it means that it's necessary to manually intervene each time. Both ACR and Phase One apply their own automated white balance but they don't always hit the mark. 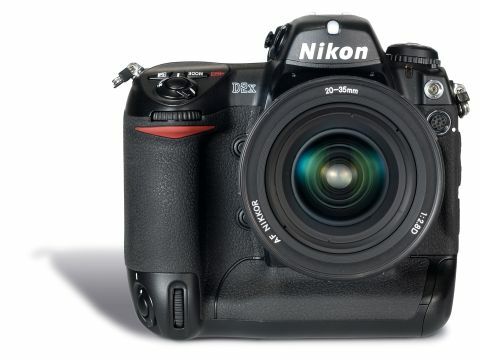 Using Nikon's underpowered PicturePerfect 1.1 isn't a real option, and the extra £110 for Nikon Capture 4.2's money badly spent - it's incredibly slow and has a frustrating interface. The good news is that image quality from the D2X is first class. The NEF (RAW) files display a fantastic level of detail and sharpness, requiring less software sharpening that's standard for DSLRs. Dynamic range is very good - and we managed to rescue an enormous amount of detail from shadows clipped by two whole stops without introducing the usual prohibitive levels of noise - an unprecedented triumph. Nikon Capture, ACR and Phase One didn't produce any problems with colour accuracy once the white balance was correctly set (and JPEGs are perfect), though there's the usual yellow/green blotch issues with skin if the green/ magenta slider isn't right.